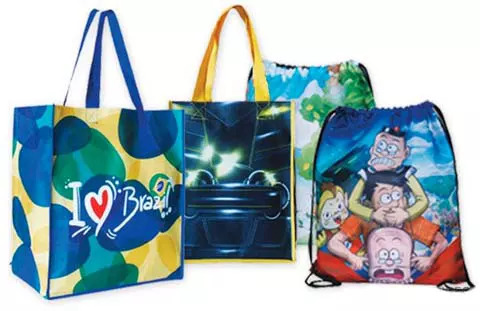 Dye Sublimation delivers extraordinarily vibrant, brilliant graphic reproduction for premium quality full color reusable tote bags and drawstring cinch bags. These custom printed bags are ideal for marketing, promotions, trade shows, and special events. A dye sublimation heat press transfers digital graphic images under high temperature and pressure to non-woven laminated and non-laminated tote bags. The dye permeates and bonds to the material for permanent, full color and photographic images, resistant to cracking, peeling, and fading. Vivid, photographic-quality dye sublimation printing delivers continuous tone from edge to edge for bright, full panel visual presentations. Choose from multiple bag sizes that you can fully customize on all sides with your branding and graphics, or choose to just customize on two sides for faster turnaround and better pricing. Finish off your tote bag with multiple color choices for handle, trim, and gussets. Drawstring sport pack style bags are available in custom sizes and allow for full color printing on the the front panel along with your choice of select back panel colors.